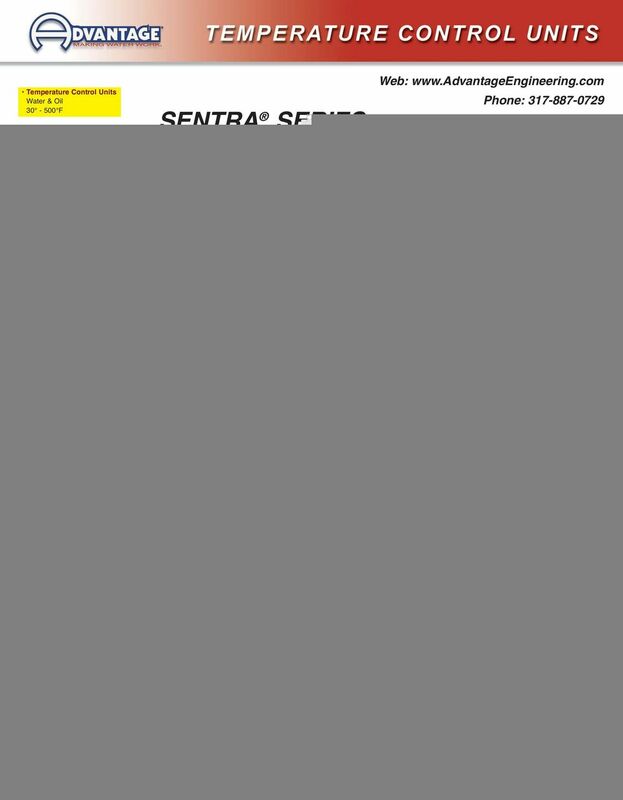 Download "SENTRA SERIES WATER UNITS. 30 to 300 F Process Temperatures. 1/2 to 7.5 HP Centrifugal Pumps (20-100 GPM) 10 to 34 KW Stainless Steel Heaters"
2 THE SENTRA SYSTEM The Sentra is used to preheat a process to the desired operating temperature by engaging the unit s electrical immersion heater and recirculating the water in the system. Upon reaching the operating temperature the Sentra can continue to add heat or becomes a cooling device by exchanging a small amount of recirculated water with cooling water from an external source. The cooling water is precisely metered into the system by cooling valve. INSTRUMENTATION... choice of microprocessor instrument offers precise temperature control, machine status and diagnostic information presented in an easy-tounderstand interface (not visible from this angle). SENSOR PROBE... placed in the fluid steam for accurate temperature monitoring. The To Process sensor reads process temperature delivered to process. The High Temperature Limit protects against overheating. HE & 0 Instruments include a From Process sensor probe. ELECTRICAL CABINET... hinged door opens to allow full access to electrical components. FLOW METER... optional accessory on HE instruments monitors process flow. Flow is displayed in GPM (gallons per minute) or LPM (liters per minute). Knowing the process flow is critical for fine tuning heat transfer efficiency. MOTOR... horizontal orientation extends pump seal service life and assures that water and debris will not foul motor windings. STAINLESS STEEL CABINET... durable and sturdy construction, vented to dissipate excess process heat, and easy to clean. The rear cover panel is easy-to-remove for access to the mechanical components (panel removed in photo). COOLING CYLINDER POWER CORD... 0 factory installed 4 wire power cord ( power & ground). Ready for installation to customer supplied disconnect. (Not shown in picture). PRESSURE GAUGES... indicates to process and from process pressure. The operator can determine ΔP, pump direction and other operating characteristics from these gauges. HEATER... flange mounted for easy service. TO PROCESS CONNECTION... all unit connection ports are machined into reinforced bosses to provide strong and rigid connections. COOLING WATER DRAIN CONNECTION COOLING VALVE... provides precise control and easy maintenance. AVT TM modulating valve on LE & HE models. PVT TM solenoid valve on VE and 0 units. FROM PROCESS CONNECTION HEATING CYLINDER... cylinder castings are custom designed to eliminate leak-prone pipe fittings found on competitive models. The Heating and Cooling cylinders are flange mounted to the pump casing. COOLING WATER SUPPLY CONNECTION PUMP CASING... with built-in seal flush for extended pump seal service life. CASTERS... swivel casters allow easy mobility. GALVANIZED STEEL BASE... provides a rigid, strong, and long lasting support structure. CLOSED CIRCUIT SYSTEMS... use to isolate the process loop from the cooling loop. The closed circuit kit can be field or factory installed. WATER PURGE KITS... removes process water from the process to the unit drain. The purge kit is supplied as a factory installed option or a field retrofitted kit. 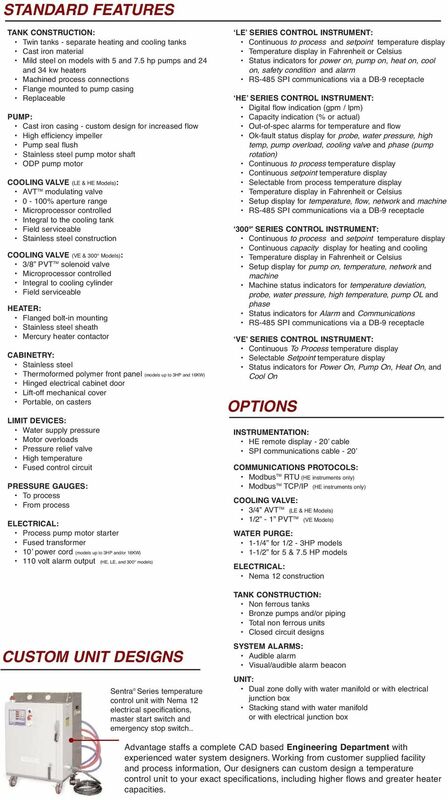 COMPONENTS Phone: Web: HEATER... KW to KW are offered. The heater is made with an stainless steel sheath. The stainless steel sheath minimizes pitting damage from dissolved chemicals in the process water. The stainless steel sheath also performs well during high temperature duty when compared to copper heating elements. The heater has a flange for bolt-in mounting and an o ring seal to prevent leaking. The heater is easy to replace if needed. MERCURY CONTACTOR... engages the heater to add heat to the process circulation. 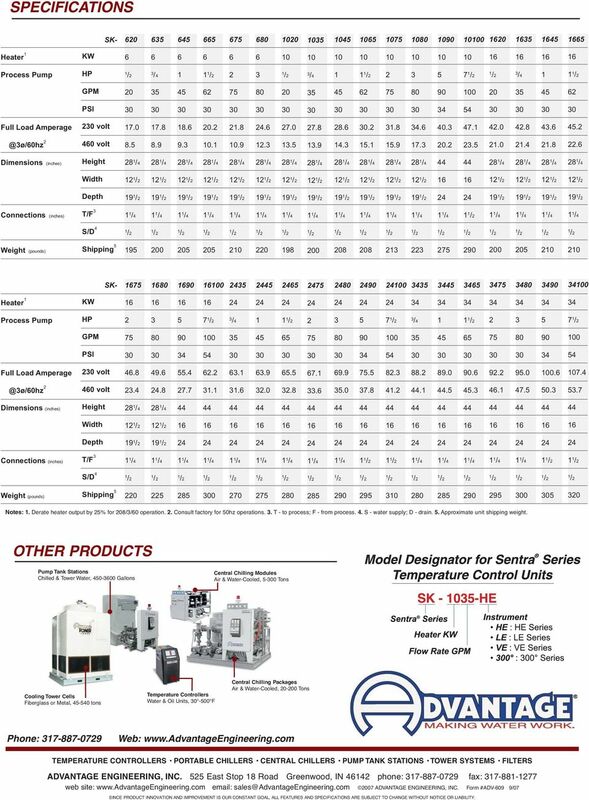 Mercury contactors are more reliable and last longer compared to conventional mechanical contactors. PROBES... solid state temperature sensors are embedded in a threaded bulbwell. All probes are terminated with quick-disconnect plugs to ease service and maintenance. 3 CENTRIFUGAL PUMP The custom designed casing and impeller generates 0% more flow with the same horsepower as compared to competitive machines. Standard HP pumps produce GPM at PSI. Refer to the pump curves for more details. The pump casing has vertically facing machined ports that receive the heating and cooling cylinder assemblies. This eliminates dozens of flow restricting and leak prone pipe fittings found on some competitive machines. The motor is mounted horizontally to extend bearing and seal life. All Sentra temperature control units have an open drip proof motor with a stainless steel shaft. A pump seal flush line diverts a portion of the water flow over the pump seal to wash away solids and debris that may damage the seal. The standard shaft seal is covered by a lifetime warranty on most standard models. AVT TM MODULATING COOLING VALVE The Sentra temperature control unit relies on an external source of cooling water. The patent pending AVT TM (Advanced Valve Technology) is the industry s first and only modulating cooling valve designed specifically for temperature control units. The AVT TM cooling valve offers straight line temperature control by opening or closing in 000 steps, from 0% to 00% to pass a precise flow to drain. This introduces cooling water from plant supplies with no water hammer pressure spikes or temperature swings. At start-up the AVT TM valve opens for about seconds so that trapped air can be purged from the process piping. A modulating cooling valve has the approximate cooling capacity of a solenoid valve. (LE & HE Models Only) Solenoid Valves are 00% open or closed. Temperature Profile : Solenoid Valve AVT TM Modulating Valves are open from 00% to 0% in response to the process and results in straight line temperaure control. Temperature Profile : AVT TM Valve Setpoint Setpoint Straight line control is difficult to achieve with a solenoid valve because it is either fully open or closed. As it opens, it passes a slug of over-temperature water to drain and introduces an equal portion of cooling water. As it closes, it creates a pressure spike known as water hammer sending shock waves across the process and rapidly decreasing the useful life of pump seals, O-rings, and other system components. The over-cooling pulse creates wasteful heater operation and consumes electrical energy. The AVT TM modulating cooling valve eliminates this. The AVT TM valve provides precise cooling with no water hammer. The Sentra cannot achieve temperatures below the cooling water supply temperature and generally will provide slightly warmer water to process compared to the cooling water temperature even with the cooling valve fully open. Your Advantage sales representative can help you select the proper cooling valve for your application. ELECTRICAL PANEL Sub-panel mounted electrical components are selected for reliability and are UL approved. Color coded numbered wires are easy to identify for service purposes. A 0 power cord is included on standard models up to HP and KW. The transformer supplies power to the control circuit. The motor starter is a high grade contactor type, tested for over 0,000 cycles. A mercury contactor is standard for the heater and is more reliable and lasts longer than mechanical contactors. NEMA electrical construction is standard and suitable for the majority of applications. NEMA electrical construction is available. Phone: Web: WATER PRESSURE SWITCH... monitors water supply pressure. Minimum supply pressure of 0 PSI is required to maintain process temperatures over 00 F. For process temperatures over 0 F minimum water supply pressure of PSI is critical. HEATING & COOLING CYLINDERS... separate heating and cooling cylinders are required for precise blending of process and cooling water. Cylinders are cast iron from custom molds with reinforced bosses for process and ancillary connections. The tanks are flange mounted to the pump casing. PRESSURE GAUGES... To and From process pressure gauges are standard and are placed across the process to provide full process performance information. Pump generated pressure is determined by the difference between the two pressure readings. Plant water supply pressure is indicated when the unit is off and the plant s water supply pressure is on. 4 CONTROL INSTRUMENTS FLOW METER... made of high quality elastomer to operate under high temperature and a wide range of flows. For Process Temperatures up to 0 F. The HE Series provides Four Large Display Windows showing Temperature, Setup, Flow, and Capacity. Process temperatures can be displayed in Fahrenheit or Celsius. Setup parameters are easily programmed. The built-in flow meter displays process flow in gallons per minute (gpm) or liters per minute (lpm). Capacity displays the heating or cooling capacity in use. Six OK - Fault Indicators monitor unit operation and display green for Ok conditions and Visual alarm outputs are provided for temperature and flow deviations. An optional audible alarm is available. Machine Status Indicators are provided for probe, water pressure, high temp, pump overload, valve and phase. Built-in SPI Communications allow for set up and monitoring from a control network. A 0 communications cable is available as an option. The Advantage AVT TM modulating cooling valve is used with this instrument. For Process Temperatures up to 0 F. The LE Series instrument provides Two Large Display Windows showing To Process and Setpoint temperatures. Setup parameters are displayed when necessary. The proximity of these display windows allow instant analysis of unit performance. Temperatures can be displayed in Fahrenheit or Celsius. Machine Status Indicators are provided for power, safety, alarm, pump, heat and cool. Built-in SPI Communications allow for set up and monitoring from a control network. A 0 communications cable is available as an option. The Advantage AVT TM modulating cooling valve is used with this instrument. For Process Temperatures up to 0 F. For Process Temperatures up to 0 F. The VE Series provides One Large Display Window showing To Process Temperature. Status indicators lights show Power On, Pump On, Cool On, and Heat On. The PVT TM pulsed solenoid Cooling is used with this instrument. The VE Series unit is best suited for application with smaller cooling loads or when operating with a large temperature difference between the cooling water supply and the set point. The 0 F Series is the instrument of choice when the required process temperature exceeds 0 F up to 0 F. Providing Three Large Display Windows showing Temperature, Setup, and Capacity. Process temperatures can be displayed in Fahrenheit or Celsius. Setup parameters are easily programmed. Six OK - Fault Indicators monitor unit operation and display green for Ok conditions and red for Fault conditions. Visual alarm outputs are provided for temperature deviation. Machine Status Indicators are provided for probe, water pressure, high temp, pump overload and phase. Built-in SPI Communications allow for set up and monitoring from a control network. Modbus TM and other interface methods are optional. A 0 remote communications cable is optional. 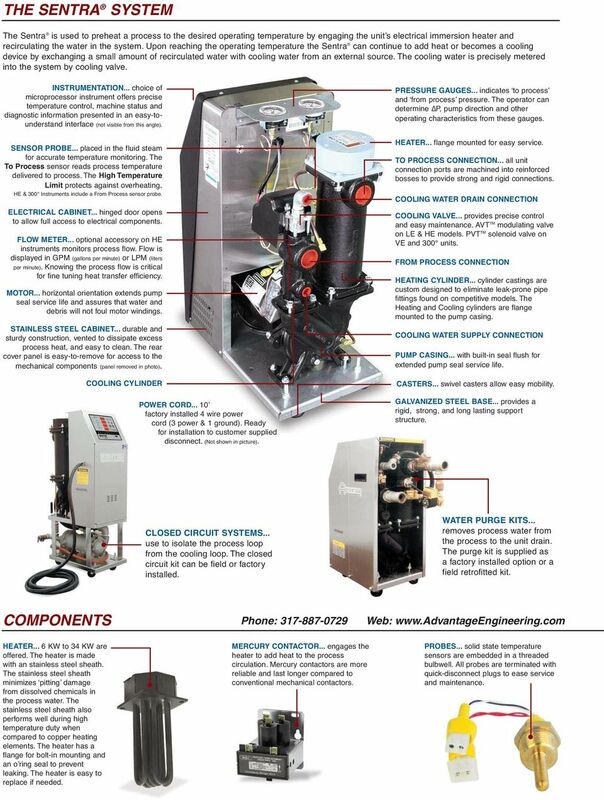 The unit requires an external source of water for system filling, pressurizing and cooling. The minimum water supply pressure is psi to operate up to 0 F. A pulsed /8 solenoid cooling valve is used with this instrument. 5 STANDARD FEATURES TANK CONSTRUCTION: Twin tanks - separate heating and cooling tanks Cast iron material Mild steel on models with and 7. hp pumps and and kw heaters Machined process connections Flange mounted to pump casing Replaceable PUMP: Cast iron casing - custom design for increased flow High efficiency impeller Pump seal flush Stainless steel pump motor shaft ODP pump motor COOLING VALVE (LE & HE Models): AVT TM modulating valve 0-00% aperture range Microprocessor controlled Integral to the cooling tank Field serviceable Stainless steel construction COOLING VALVE (VE & 0 Models): /8 PVT TM solenoid valve Microprocessor controlled Integral to cooling cylinder Field serviceable HEATER: Flanged bolt-in mounting Stainless steel sheath Mercury heater contactor CABINETRY: Stainless steel Thermoformed polymer front panel (models up to HP and KW) Hinged electrical cabinet door Lift-off mechanical cover Portable, on casters LIMIT DEVICES: Water supply pressure Motor overloads Pressure relief valve High temperature Fused control circuit PRESSURE GAUGES: To process From process ELECTRICAL: Process pump motor starter Fused transformer 0 power cord (models up to HP and/or KW) 0 volt alarm output (HE, LE, and 0 models) CUSTOM UNIT DESIGNS Sentra Series temperature control unit with Nema electrical specifications, master start switch and emergency stop switch.. LE SERIES CONTROL INSTRUMENT: Continuous to process and setpoint temperature display Temperature display in Fahrenheit or Celsius Status indicators for power on, pump on, heat on, cool on, safety condition and alarm RS-48 SPI communications via a DB-9 receptacle HE SERIES CONTROL INSTRUMENT: Digital flow indication (gpm / lpm) Capacity indication (% or actual) Out-of-spec alarms for temperature and flow Ok-fault status display for probe, water pressure, high temp, pump overload, cooling valve and phase (pump rotation) Continuous to process temperature display Continuous setpoint temperature display Selectable from process temperature display Temperature display in Fahrenheit or Celsius Setup display for temperature, flow, network and machine RS-48 SPI communications via a DB-9 receptacle 0 SERIES CONTROL INSTRUMENT: Continuous to process and setpoint temperature display Continuous capacity display for heating and cooling Temperature display in Fahrenheit or Celsius Setup display for pump on, temperature, network and machine Machine status indicators for temperature deviation, probe, water pressure, high temperature, pump OL and phase Status indicators for Alarm and Communications RS-48 SPI communications via a DB-9 receptacle VE SERIES CONTROL INSTRUMENT: Continuous To Process temperature display Selectable Setpoint temperature display Status indicators for Power On, Pump On, Heat On, and Cool On OPTIONS INSTRUMENTATION: HE remote display - 0 cable SPI communications cable - 0 COMMUNICATIONS PROTOCOLS: Modbus TM RTU (HE instruments only) Modbus TM TCP/IP (HE instruments only) COOLING VALVE: AVT TM (LE & HE Models) - PVT TM (VE Models) WATER PURGE: - for - HP models - for & 7. HP models ELECTRICAL: Nema construction TANK CONSTRUCTION: Non ferrous tanks Bronze pumps and/or piping Total non ferrous units Closed circuit designs SYSTEM ALARMS: Audible alarm Visual/audible alarm beacon UNIT: Dual zone dolly with water manifold or with electrical junction box Stacking stand with water manifold or with electrical junction box Advantage staffs a complete CAD based Engineering Department with experienced water system designers. Working from customer supplied facility and process information, Our designers can custom design a temperature control unit to your exact specifications, including higher flows and greater heater capacities. 6 SPECIFICATIONS SK Heater KW Process Pump HP 7 GPM PSI Full Load Amperage volt volt Dimensions (inches) Height Width Depth Connections (inches) T/F S/D 4 Weight (pounds) Shipping SK Heater KW Process Pump HP GPM PSI Full Load Amperage volt volt Dimensions (inches) Height 8 8 Width Depth 9 9 Connections (inches) T/F S/D 4 Weight (pounds) Shipping Notes:. Derate heater output by % for 08//0 operation.. Consult factory for 0hz operations.. T - to process; F - from process. 4. S - water supply; D - drain.. Approximate unit shipping weight. OTHER PRODUCTS Pump Tank Stations Chilled & Tower Water, 0-00 Gallons Central Chilling Modules Air & Water-Cooled, -0 Tons Cooling Tower Cells Fiberglass or Metal, -0 tons Temperature Controllers Water & Oil Units, -00 F Central Chilling Packages Air & Water-Cooled, 0-00 Tons Phone: Web: TEMPERATURE CONTROLLERS PORTABLE CHILLERS CENTRAL CHILLERS PUMP TANK STATIONS TOWER SYSTEMS FILTERS ADVANTAGE ENGINEERING, INC. East Stop 8 Road Greenwood, IN 44 phone: fax: web site: ADVANTAGE ENGINEERING, INC. Form #ADV-09 9/07 SINCE PRODUCT INNOVATION AND IMPROVEMENT IS OUR CONSTANT GOAL, ALL FEATURES AND SPECIFICATIONS ARE SUBJECT TO CHANGE WITHOUT NOTICE OR LIABILITY. LOADING DOCK EQUIPMENT. A. Section 03100 - Concrete Forms and Accessories: Placement of anchors into concrete. 4. The water tank shall be mounted at the truck frame level to provide a low center of gravity for truck stability. SANITARY & WASTE WATER PUMPING SYSTEMS. Now you can install kitchen, bathroom, laundry and commercial facilities almost anywhere.